In order to give modellers some detail views for a most accurate look of their work, I took some photographs showing a P-51D-25-NA airframe in practically stock configuration. The only external changes done in Switzerland were an additional air scoop in front of the windshield, the relocation of the coolant-vent, and the installation of Swiss designed rocket-launchers under the wings. Therefore, the panel lines, access hatches and other outward appearance of this aircraft is as it came from the production line in 1945. Most of P-51's that fly today as warbirds or racers have seen partial or complete rebuilds during their careers and therefore are questionable reference material for serious modellers of wartime P-51's ! 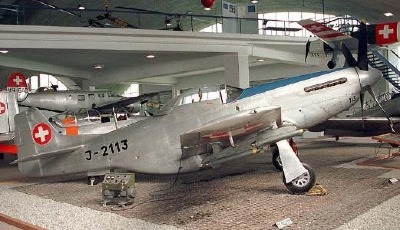 The only surviving Swiss P-51D, currently displayed at the Swiss Air Force Museum in Dübendorf near Zurich is P-51D-25-NA 44-73349 / Swiss AF J-2113. 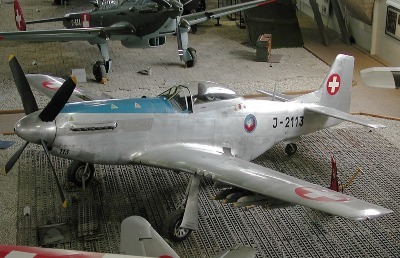 Modellers who intend to build a Swiss Air Force P-51D are invited to contact me for more detail shots and assistance regarding stencils, positioning of markings, etc.